Currently there are hundreds of container shipping lines around the world. They vary from giant corporations (such as Maersk, CMA-CGM, Hapag-Lloyd, China Shipping Container Lines...) with hundreds of container vessels, to medium regional lines operating dozen of vessels (e.g. RCL, TS Lines), to even much smaller companies operating just few or even one box ship (usually domestic shipping lines in countries). Those companies provide different wide range of services, yet, they all serve a common mission: transporting cargo containers around the world. According to AXS-Alphaliner, a worldwide reference in liner shipping, 100 leading container shipping lines are operating (either owning or chartering in) approximately 4,400 vessels, with capacity of about 12.5 million TEUs, which accounts for up to 96,1% the capacity of the whole world’s cellular fleet. The world containership fleet in January 2010 has over 4,700 vessels with total capacity of about 13 million TEUs. The detail rankings and capability of 100 top container shipping lines are summarized in the following table. From different perspective, those container shipping lines are sorted by country where head offices are located. That way shows 10 nations with largest fleet of container ships. Among top 100 leading container lines, Vietnam only have two representatives with modest position: Vinalines (ranking 67) and Bien Dong (ranking 78). 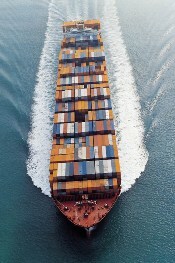 In Vietnam, container liner service only began from late of the 1980s. At the beginning of 2010, Vietnam has 12 container shipping lines which own and operate over 30 liners of total 20,600 TEUs. Some operators participated in the liner market from last decade, such as Gemadept, Vinalines, Vinafco… while some other players are pretty new in the market; VSICO, VOSCO are examples. Some other lines have only one ships, either owning (like Viconship) or chartering (Viet Sun). Names of these companies are listed below. In general, most Vietnamese container shipping lines provide domestic service on Haiphong-Hochiminh and backward route. Several lines with more experience (Gemadept, Vinalines, Bien Dong) provide feeder services to regional hub-ports like Hong Kong, Singapore. Viconship is deploying a 380-TEU feeder ship on Hai Phong-Hong Kong. DHP (a joint venture between Dong Do and Hai Phong port) some time send their vessels to the same route, yet whenever possible, they alter plan and offer to chartering out their ships. With restricted service network, Vietnamese container shipping lines only take care of small percentage of trade volume to and from the nation. Main players in the attractive market are still foreign main shipping lines. In 2010, more than 40 foreign shipping lines are present in Vietnam, and taking an important role in import-export shipping market. They maintain activities through a local agent, a joint-venture, or in a few cases, a company with 100% foreign ownership.